Venus is the planet of love and relationships, so she can be one of the most important plants in the composite chart. She shows how you can be affectionate, how you express your loving feelings, and where can find it easy in the relationship. 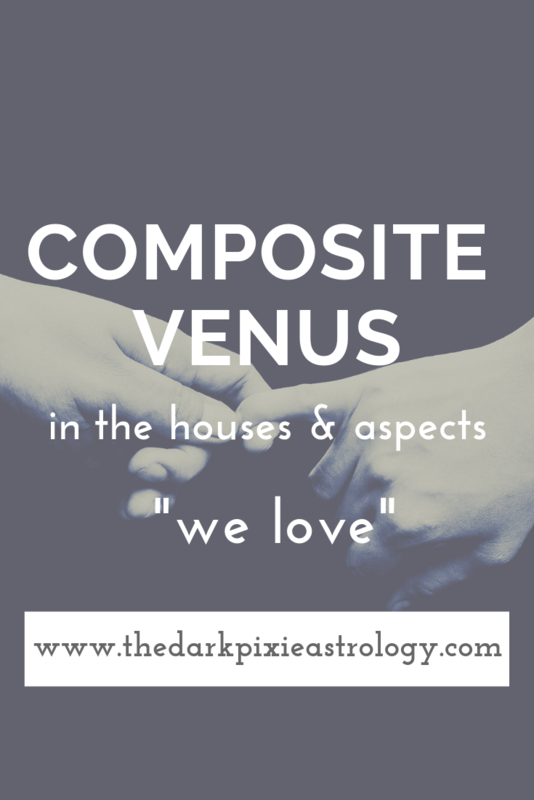 With Composite Venus in the 1st house, the relationship can be of central importance to each of you, and you can show one another affection and love more than with others. You can be open about how you feel about the relationship, and you can genuinely like one another. You can find it easy to get along, and you can feel good about yourselves with each other and in this relationship. This can be a good placement for virtually any type of relationship because you can like each other as people. With Composite Venus in the 2nd house, you can feel this relationship is more stable than others you’ve had or have in your life. Neither of you can feel the need to rock the boat, and you can feel more confident and secure with one another. If in a romantic relationship, you can put more emphasis on passion and a physical connection, as well as loyalty. This can be a good position for a business relationship focused on making money, and you can find it easy to accumulate wealth together. With Composite Venus in the 3rd house, you can enjoy communicating openly with one another and expressing yourselves within the relationship. You may take a more analytical, logical approach to the relationship, which can be an issue in a romantic relationship if you’re not making sure you have an emotional connection. Talking with one another about your relationship can be important, and you can find it easier to understand one another intellectually. You can appreciate variety within the relationship, and may be more sociable together. With Composite Venus in the 4th house, you can enjoy opening up with one another emotionally, and find it easier to connect emotionally. Feelings can be an important part of your relationship, and even a relationship that isn’t personal can have a lot of emotions invested in it. This can be an excellent position to build a family or for a family relationship since the 4th house rules the home and family. You may feel you have a solid foundation for the relationship. With Composite Venus in the 5th house, you can enjoy focusing on the things you love most together. You can come together over common hobbies and interests, and do these things together (maybe you even met this way). You can be creative together, inspired by one another, and want to have fun together. You can be more affectionate with one another, which can be good for a personal relationship, and a romantic relationship can have extra romance and sparks. Just make sure you’re taking it seriously when you need to be. With Composite Venus in the 6th house, you can be more practical with one another and about your relationship. You may not be outwardly affectionate with one another, or at least not excessively affectionate, but you can focus on the ways you can improve the relationship and try to make it better constantly. This can be good if you don’t take it too far and demand perfection. With the 6th house ruling work, this can be a good position for a work relationship, and you can work well together, and may have met through your jobs. With Composite Venus in the 7th house, this is one of the houses Venus naturally rules and is the house of committed relationships, so this is a great placement for virtually any relationship. You can get along well, you can enjoy each other’s company, and you can show affection more easily. You may try to get along so much that you avoid fights though, so try not to do that and hash it out when you need to so you don’t have an resentments. With Composite Venus in the 8th house, you can have an intense connection, and a romantic relationship can be extremely passionate physically and emotionally. It can be difficult to have a casual relationship with this placement, and you take the relationship very seriously. Sometimes you can be a little obsessed with one another with this position, and need to make sure you’re not getting lost in the relationship. You may find it easier to balance the power in the relationship between you, but you can also enjoy fighting a little too much sometimes. With Composite Venus in the 9th house, you can enjoy having new experiences together. You can feel bolder and more adventurous in the relationship, and you can take risks and do things that expand your lives in new ways. This placement can be great for a friendship, and you get along well, but in a romantic relationship, you will likely require a great deal of space so you don’t feel like you’re suffocating one another. You may find it easier to give that to each other though. One of you may take on the role of teacher and the other, student. With Composite Venus in the 10th house, you can be more traditional with this relationship, whatever it may be, and with your roles within the relationship. You can be more mature and responsible with one another, and you can take the relationship seriously. You may be more outwardly affectionate with one another, and can be seen as an ideal relationship. This can be excellent for a business relationship since this house rules the career, and you can find it easier to achieve your goals together, and may have met through your careers. With Composite Venus in the 11th house, you can get along as friends very well, no matter what type of relationship it is. You can have a good understanding of one another and allow each other to be who you are and embrace your differences within the relationship. You can focus on your hopes and dreams together, and find it easier to make progress to achieve your hopes and dreams together. You may have an unusual relationship or setup, or you may seem like an unusual pairing. With Composite Venus in the 12th house, you may have a hard time showing affection and love for one another. You may hold back on what you feel for each other, keeping it to yourselves and not feeling comfortable expressing it for some reason. You can have a secret relationship or partnership for one reason or another. When you stick together, you can be affectionate when other people aren’t around, behind closed doors, just the two of you. You can find it easier to open up about old wounds and issues, and you may feel you have a soul connection. With Composite Sun conjunct Composite Venus, this can increase the love and affection between you. You can show how you feel more openly, and you can find one another to be pleasant and accommodating. Conflict may be difficult at times though, so you need to compromise without compromising your beliefs. Because of how closely the Sun and Venus are to one another in transit, they cannot be any other major aspect in the composite chart. With Composite Moon conjunct Composite Venus, you can have loving, affectionate feelings toward one another, no matter what the relationship. You can feel good with one another and in the relationship. With Composite Moon, sextile or trine Composite Venus, you can enjoy one another’s company, find each other pleasant, and find the relationship to be easier. With Composite Moon square or opposite Composite Venus, you can still enjoy one another’s company and be pleasant, but you may be lazier with one another or with the relationship, and have stubbornness become an issue at times. With Composite Mercury conjunct Composite Venus, it can be quite easy for you to communicate in a pleasant way and get along well. You may not give in to harsh words with one another, and try to be more compromising, balanced, and fair in your communications with one another. With Composite Mercury sextile Composite Venus, you can communicate well and enjoy communicating with one another, allowing ideas to flow in a pleasant way. Because of the way Mercury and Venus move in relation to one another, they cannot be any other aspect. With Composite Venus conjunct Composite Jupiter, the loving feelings between you can be strong, and you can greatly enjoy one another’s company. In a personal relationship, you can almost be one another’s good luck charm, and in a professional relationship, you can have many opportunities for success together. With Composite Venus sextile or trine Composite Jupiter, you can get along more easily, enjoy being with one another, and are more optimistic together. With Composite Venus square or opposite Composite Jupiter, you can still get along fairly well, but you may be lazy in the relationship, and if problems arise, you may feel that you don’t need to deal with them, so you have to force yourselves to take action when required. With Composite Venus conjunct Composite Saturn, you can stick together and feel quite committed to one another, but the ability to express your feelings and show affection may be limited in a personal relationship. You have to work on allowing one another to be more expressive with your feelings. This can be a better position in a professional relationship, and you can work hard together toward a common goal. With Composite Venus sextile or trine Composite Saturn, this can ring stability to the relationship, and you each can be more mature, responsible, and measured. With Composite Venus square or opposite Composite Saturn, the relationship can feel very constricting and limit each of you in some way. You may feel a distance between you, and outward expressions of love can be nonexistent if you don’t out a conscious effort in.